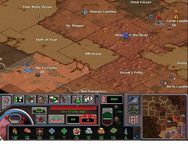 Deadlock II: Shrine Wars features turn-based gameplay that takes place on a planet map that ranges from around 20 to 80 tiles, each representing a territory, or area of land. Players take control of each territory by colonizing it with a "Colonizer" vehicle or taking it from another player through military conquest. Each territory consists of a six-by-six grid in which buildings can be placed. Like most strategy games, Deadlock II: Shrine Wars uses natural resources, manufactured resources, and credits to pay for new units and buildings. Colonists are assigned to buildings to generate resources and research. These new units and buildings are able to be created after their prerequisite technologies are researched. 3. Additional gameplay elements such as diplomatic alliances, more researchable technologies, more units, more buildings, and the ability to create a city on water. Source: Wikipedia, "Deadlock II: Shrine Ware," available under the CC-BY-SA License.